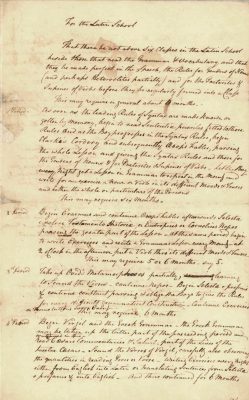 This description of the curriculum in the Academy covers the time period from its founding in 1749 to the reorganization of the Academy after the 1791 union of the College with the University of the State of Pennsylvania. 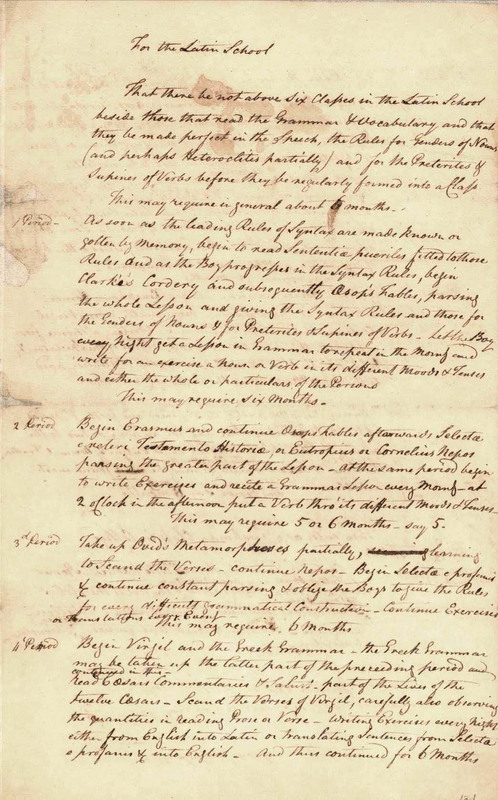 The curriculum represented a divide between the majority of the trustees and Benjamin Franklin regarding the nature of the education to be provided. Because the majority of the board had received classical educations, they favored a similar curriculum for the new school. Franklin on the other hand, had a revolutionary idea: he favored an education that stressed practical skills that would serve students regardless of what line of work they took up. Thus, Franklin advocated the teaching of all classes in English, with an emphasis on mathematics and natural philosophy (science). By the late 1750’s William Smith, the first provost, introduced more elements of classical education, but Franklin’s practical curriculum was not abandoned. The Academy and College were broken down into a number of smaller units that the trustees called “schools.” The trustees used the word “school” to refer to a specific teacher (master), his assistants (tutors or ushers), his classroom, and the curriculum taught in the room. Academy students enrolled in one school at a time: the English School, Mathematics School or Latin School. College students were enrolled in the Philosophical School. Additional instruction was often provided in the various schools as was seen fit. Writing masters were found in various schools; for example, the Trustees minutes record the employment of Constable and Donaldson in 1755, and Hugh Williamson in the Latin School only in 1756. In accord with Franklin’s interest in the teaching of modern languages, John Mathias Cramer was hired to teach French and German from 1753 to 1755. Students wishing instruction in these subjects usually paid additional tuition directly to the instructor if he was given permission by the trustees to teach at the Academy. Instruction in these courses was not offered every year. During the 1780s and early 1790s German was of particular interest because of the large German speaking population in Philadelphia and the vicinity; there was an attempt to establish a German School within the University, led from 1780 to 1784 by John C. Kunze, Professor of German and Hebrew in the College, and then by Professor of German Justus Henry Christian Helmuth. The idea was to instruct German-speaking students in Greek and Latin and other subjects as well as to teach German to English-speaking boys in the Academy. This German School never became a reality within this institution; German students found their education elsewhere. Sixth (or highest) Class – History, rhetoric, logic, moral and natural philosophy – all these continued; reading and explaining the best English authors, as Tillotson, Milton, Locke, Addison, Pope, Swift, “the higher papers in the Spectator and Guardian,” and “the best translations of Homer, Virgil and Horace, of Telemachus, Travels of Cyrus, etc. William Smith’s 1762 Account of College, Academy and Charitable School provides a glimpse into the evolution of this curriculum. After the University of the State of Pennsylvania was created in 1779, the contents of the curriculum remained essentially the same; however, the classes were renamed so that the highest class became the “First” class. After the formation of the University of Pennsylvania in 1791 the trustees instructed that the Master of the English School be responsible for the teaching of criticism, composition, oratory, geography, writing and common arithmetic, with as many assistants as required by the number of students enrolled. Enrollment figures from the Trustees Minutes indicate that generally a total of over a hundred students were enrolled at any one time in the five classes of the English School during the 1790s. Another thirty or so students from the Mathematics School were enrolled part-time in the English School, taking courses in the afternoon. The Mathematical School was prominent for a number of reasons. During Penn’s early years, the combination of Enlightenment thought and the practical needs of colonial life led to considerable public interest in both pure and applied mathematics. The Mathematics School’s stress on practical studies certainly measured up favorably when held to Benjamin Franklin’s yardstick of utility. Many students whose education would not include College were interested in practical mathematical skills to prepare them for careers as surveyors, navigators, clerks, mechanics and bankers. The trustees’ were able to attract a number of excellent mathematical masters, beginning with Theophilus Grew. After the establishment of the College, mathematics became an important part of the College curriculum – in William Smith‘s natural philosophy, Ebenezer Kinnersley‘s interest in electricity, and David Rittenhouse‘s genius for applied mathematics. There are some indications, after the first decade, of a narrowing of the range of mathematics taught in the Academy’s Mathematical School. Grew himself was promoted to a professorship in the College, and the curriculum of the Mathematical School focused more and more on basic arithmetic and writing skills. 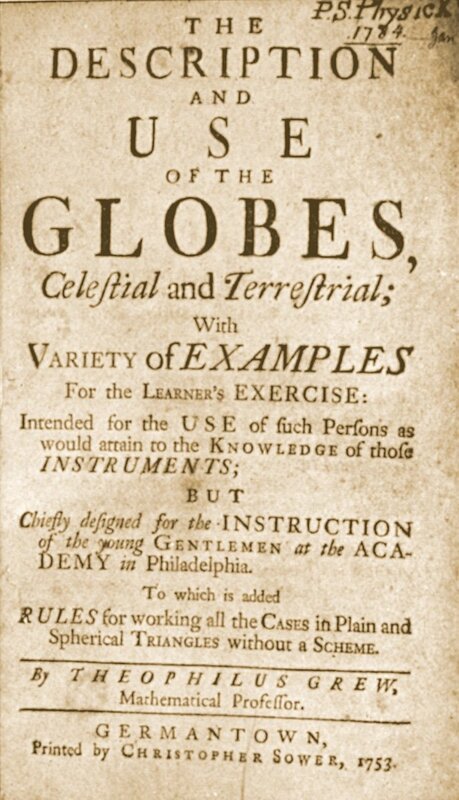 After the formation of the University of Pennsylvania in 1791 the trustees instructed that the Master of the Mathematics School be responsible for the teaching of such areas of practical mathematics as arithmetic, bookkeeping, history, geography, navigation, surveying, gauging and drilling. Enrollment figures from the Trustees Minutes indicate that, during the last decade of the eighteenth century, generally sixty or seventy students were enrolled full time at any one time, with another 30 or 40 students from the English School attending classes here part-time in the afternoons. The largest group of students were learning arithmetic, while smaller numbers had advanced to more specialized skills. Until the formation of the College in 1755, our knowledge of the Latin School curriculum is not specific, but it is certain that Latin School masters were hired on the basis of their ability to teach Latin and Greek languages, history, geography, chronology, and rhetoric as well as speaking, writing and understanding of English. Francis Alison also probably taught arithmetic, Euclid’s elements, practical branches of mathematics and logic, and moral philosophy. After the 1755 formation of the College, the Latin School became the preparatory school for the College. By 1762, Provost William Smith included the Latin School as part of the College, but attendance in this school did not lead to a college degree. Boys in the Latin school were the same age as the boys in the English School, but had already learned the rudiments of English and arithmetic. The liberal arts curriculum of the Latin School prepared them for entrance into the College. In effect, the Latin School was a connecting link between the Academy and the College. First Form or Stage – included grammar and conjugation, vocabulary, and beginning of writing in Latin. Readings were Senentiae Pueriles, Cordery, Aesop and Erasmus. English writing, reading and speaking were continued as well. Second Stage – included Latin grammar, exercises and writing. Readings were Selectae e veteri Testamento, Selectae e Profanis Auctoribus, Eurtopius, Nepos, and Metamorphosis. Third Stage – included geography and chronology as well as exercises and writing. Readings were Metamorphosis (cont. ), Virgil with Parsody, Caesar’s Comment, Sallust, Greek Testament. Fourth Stage – included review of Virgil, reading of Horace, Terence, Livy, Lucian, and the beginning of Xenophon or Homer. 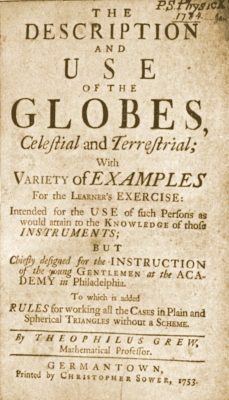 After the formation of the University of Pennsylvania in 1791 the trustees instructed that the Master of the Latin School be responsible for the teaching elements of Latin and Greek, the authors of rhetoric and also ancient geography. The content and progression of classical studies continued much the same into the 1790s. A handwritten summary of the curriculum and the weekly course schedule for the Latin School break the same readings and skills into seven rather than four stages, but the end result is the same. Grammar progressed from simple to complex grammar, with Greek being added in the last two stages. Readings began with Aesop’s fables and eventually included Ovid, Caesar and Virgil. Writing was included at each stage. Beginning students in this school also were instructed in arithmetic and bookkeeping by the Mathematics Professor. 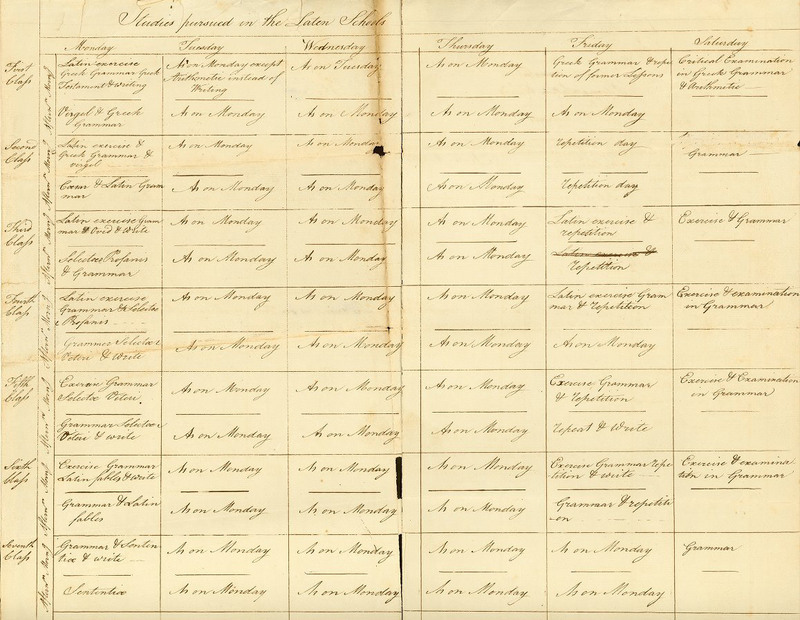 Enrollment figures from the Trustees Minutes indicate that, during the last decade of the eighteenth century, generally from fifty to seventy students were enrolled at any one time. They were spread among five classes at different levels, plus a few in a grammar classes.